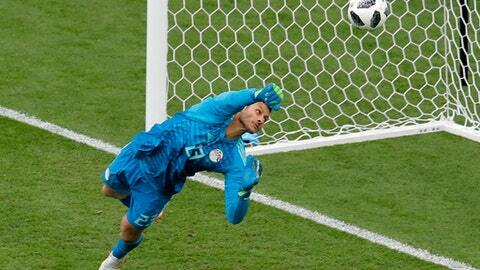 ST. PETERSBURG, Russia (AP) An Egypt team official has confirmed goalkeeper Mohamed Elshenawy declined to receive a player of the match trophy at the World Cup for religious reasons. Egypt team director Ihab Leheta told The Associated Press on Sunday that Elshenawy said a ”few words” and posed for photos in a brief ceremony, but didn’t take the goblet. ”It is up to each one,” he said. Images of Elshenawy gesturing what appears to be a rejection of the trophy held by a young Budweiser representative in the stadium’s tunnel appeared on social and mainstream media. Budweiser is among FIFA’s top sponsors.